The formal surrender of the Army of Northern Virginia took place on Wednesday, April 12th, 1865, exactly four years after the first shots were fired at Fort Sumter in Charleston Harbor. Brig. Gen. Joshua Chamberlain was placed in charge of planning and conducting the ceremonies, and his only goal was to mark the occasion with an air of dignity, solemnity, and respect for the 28,000 Confederate soldiers who laid down their arms. Chamberlain described part of the ceremony in his memoir The Passing of Armies: (Maj. Gen. John) Gordon at the head of the column, riding with heavy spirit and downcast face, catches the sound of shifting arms, looks up, and, taking the meaning, wheels superbly, making with himself and his horse one uplifted figure, with profound salutation as he drops the point of his sword to the boot toe; then facing to his own command, gives word for his successive brigades to pass us with the same position of the manual,—honor answering honor. On our part not a sound of trumpet more, nor roll of drum; not a cheer, nor word nor whisper of vain-glorying, nor motion of man standing again at the order, but an awed stillness rather, and breath-holding, as if it were the passing of the dead! The original members of the Fourteenth Connecticut Volunteer Infantry had enlisted during the summer of 1862 for a term of “three years or the duration.” By any measure they had done their duty. Joy turned instantly to deepest gloom when word was received on the 15th of the assassination of President Lincoln. A funeral service for their Commander in Chief was conducted at brigade headquarters on May 19th, even as the Lincoln’s state funeral was being held in the East Room of the White House. Only one objective remained—return home to Connecticut, but it would happen on army time. They set up their tents near Appomattox the way they always had, in neat rows that formed streets, and camped out for three weeks. Finally, on May 2nd, they packed up their gear and began their last march. On May 6th, the Fourteenth held the lead position in the long Second Corps column as they marched through the ruins of Richmond. Then they passed in review before Gen. Henry Halleck, who watched from the steps for the former Confederate capitol building. May 10th was a memorable day for the men of the Fourteenth Connecticut. In reverent silence they passed by the battlefield at Spotsylvania. They entered Fredericksburg from the south, passing over Marye’s Heights and down onto that dreadful plain of death where the regiment had been shattered nearly two and a half years earlier. Pontoons still bridged the Rappahannock and that evening they camped at Falmouth, very near the ground they had occupied during the long, cold winter of 1862-1863. They reached Alexandria on May 15th, then marched in a grand review around the Capitol and down Pennsylvania Avenue. General Hancock was in attendance and one can only imagine the hearty cheers that arose from his old corps. Finally, on May 31st, the men of the Fourteenth Connecticut Volunteer Infantry received their formal discharge papers. They boarded a train and headed north through Baltimore and Philadelphia. At New York they transferred to a steamship bound for Hartford, where they arrived early on June 8th. It seemed the entire city had turned out to welcome them home, and after being suitably feted and fed, the men said their farewells and drifted away in twos and threes toward Union Station to begin the final leg of their long journey home. PERSONAL NOTE: After almost three years and 161 blog posts, this is my last article about the Fourteenth Connecticut. It has been a privilege to honor these men and keep their record of service alive. I will keep this blog active so you can always reference it. But do not despair. I’m starting a new Civil War video blog next Friday, May 1st, titled “Civil War Sites: On Earth and in Cyberspace.” Same schedule, same great author, new and interesting content about some of the neat things I’ve come across while researching my novels. I do hope you’ll join me. Follow me on Twitter to receive messages when a new blog is posted or you can always access my new blog (starting May 1st) through my website: www.kbacon.com. This entry was posted in 1865, Appomattox Campaign, General Information, Life in Camp, Men of the 14th on April 24, 2015 by admin. 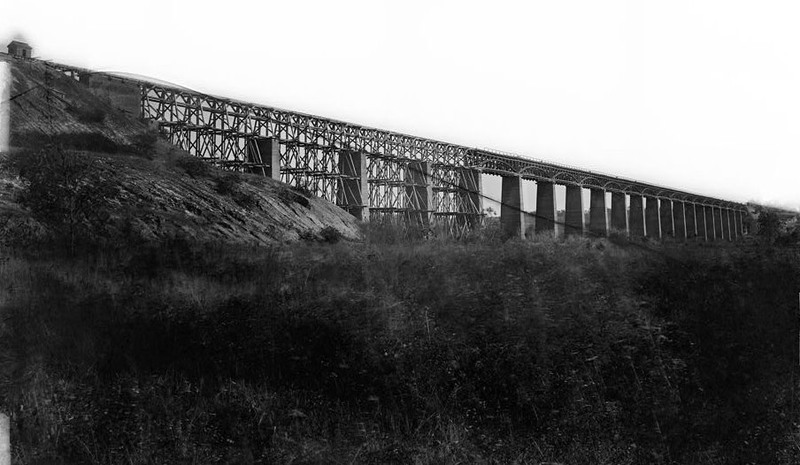 Our last engagement with the enemy was at the crossing of the Appomattox River at High Bridge. We came upon them at daylight, setting fire to the bridge; men forgot all rules and discipline in the enthusiasm of the moment. General Barlow, who commanded our division, rode at the head of the column with his staff over the bridge into the ranks of the enemy, firing his pistol at them as they were trying to apply a match to the tar on the bridge. After him went the 108th New York and then the Fourteenth Connecticut. This was the only time I saw this movement executed (rushing pell-mell across to engage the enemy). As you can see in this photo taken just after the war, High Bridge was well-named. Across the bridge we formed quickly in the meadow and on we went for miles over the hills, through the town of Farmville, where we chased the retreating foe and charged on the hen-coops of the village at the same time. We did not lose a single man in this charge, so far as I know, though we had some very narrow escapes. As we came on to the top of one of the hills, a shell buried itself in the ground at my feet and exploded, literally covering me and the men next to me with gravel stones, but without hurting any of us. Just at nightfall of that day the last man in our brigade to give his life for his country was killed, that was our commanding General (Thomas) Smyth, as noble a fellow as ever held a sword. Our congratulations over that day’s work were changed suddenly to gloom and many a soldier cried that night at the loss of a man who had shared our perils and hardships so constantly and so bravely. This entry was posted in 1865, Appomattox Campaign, Battles of the 14th, Men of the 14th on April 10, 2015 by admin. The night of April 2-3, Gen. Robert E. Lee ordered the Army of Northern Virginia to abandon Petersburg and Richmond, march about forty miles west along different routes, and reassemble at Amelia Courthouse. The ultimate goal was to escape to Danville or Lynchburg, unite with Gen. Joe Johnston’s army in North Carolina, and deal the Union army a stunning defeat. But the most pressing issue for Lee was the need for food, so Lee ordered supply trains to head for Amelia Courthouse as well. The Confederates marched into Amelia Courthouse on April 4, but no wagon trains loaded with rations had arrived. The following day, on empty bellies, Lee’s men marched south, but soon came upon Sheridan’s troopers. Lee ordered his weary troops to march another twenty miles to Farmville on the South Side Railroad where surely, there would be rations for the men, and feed for the animals. Once again, Sheridan spoiled Lee’s plans. Most of Lee’s army crossed to the north side of the Appomattox River, but Sheridan trapped about 18,000 Confederates (about one fourth of Lee’s total strength) south of the river. In the Battle of Sailor’s (Sayler’s Creek), Sheridan lost about a thousand men, but Lee lost four generals captured, including Richard Ewell, almost 8,000 men taken prisoner, and unknown numbers killed or wounded. Next week, we’ll take a look at the Fourteenth Connecticut’s final battle of the war. This entry was posted in 1865, Appomattox Campaign, Battles of the 14th, General Information on April 3, 2015 by admin. “April 2nd the regiment moved still farther to the left to the Boydton Plank Road and then advanced in line of battle through the rebel works, the enemy falling back as they approached.” (Charles D. Page, History of the Fourteenth Regiment, Connecticut Vol. Infantry.) I wish there was a glorious tale to tell of the exploits of the Fourteenth Connecticut, but in fact all of the fighting done on this momentous day was done by other units, and only one of the Second Corps three divisions saw any fighting. The general assault ordered by Lt. Gen. Ulysses S. Grant began at about 4:30 a.m. on Sunday, April 2nd. Almost simultaneously, in the first gray light of dawn, the Union Ninth and Sixth Corps surged forward from their entrenchments and crossed the no man’s land between the lines. The Ninth Corps, under Maj. Gen. John Parke, assaulted the Confederate works around Fort Mahone on the east side of Petersburg. The Confederates were led by Maj. Gen. John Gordon. Surging Federals swept up and over Fort Mahone and three other strongholds, but Gordon organized determined counterattacks and a desperate struggle began to retake the forts. This fight continued for the remainder of the day, until defeats elsewhere caused Gen. Lee to order Gordon to withdraw all of his troops to Petersburg’s inner defensive perimeter. In the predawn hours of that Sunday morning, Maj. Gen. Horatio Wright deployed his troops in a wedge formation in front of their entrenchments. They too went forward at first light, led by Brig. Gen. George Getty’s Division. Within half an hour they had broken through the lightly held Confederate lines. The defenders were put to flight and the bulk of the Sixth Corps turned left, away from Petersburg, to exploit their gains. A few units didn’t get the message about the left turn and continued straight across the Boydton Plank Road. Two enlisted men from the 138th PA became separated and were approached by two Confederate officers on horseback, who demanded that they surrender. Instead the two Union boys hid behind a tree, took careful aim and fired. One of the officers was unhurt, but the other was killed instantly—Lt. Gen. Ambrose Powell Hill. Civil War Preservation Trust Map of the Sixth Corps breakthrough. It is conceivable that had the Sixth Corps turned right instead of left, they could have marched right into Petersburg, because the western portion of the inner defenses was not yet manned as it would be later in the day. As it was, the Twenty-fourth Corps, under Maj. Gen. John Gibbon, followed the Sixth Corps through the shattered Confederate line and did turn toward Petersburg. During the afternoon they were engaged in heavy fighting at Forts Gregg and Whitworth. The forts were finally taken, but the Confederate defenders had bought enough time for troops from Longstreet’s Corps to man the western portion of Petersburg’s inner defensive line. And what of the Second Corps? The First Division, under Maj. Gen. Nelson Miles and attached to Sheridan’s western command, was sent to deal with a body of troops under the command of Maj. Gen. Henry Heth that was retreating northward after the Sixth Corps breakthrough. Heth entrenched his command along the South Side Railroad near Sutherland Station. Miles’ Federals charged once and were repulsed. A second charge was defeated as well. Miles’ sent a desperate message to Maj. Gen. Humphreys, the commander of the Second Corps, pleading for help. In the meantime, Mile’s had the Confederate position scouted and a new plan of attack was devised. The third Federal assault broke the enemy lines and Heth’s command was driven northward toward the Appomattox River. The boys in the Fourteenth Connecticut never fired a shot that day. After they advanced into the abandoned works mentioned at the start of this post, Maj. Gen. George Meade ordered Humphreys to march the rest of his corps east toward Petersburg. When Miles’ plea for help arrived, they turned around and marched west toward Sutherland. Then word came that the First Division had been victorious, so the two divisions about-faced again and struck off once more for Petersburg. This entry was posted in 1865, Appomattox Campaign, Battles of the 14th, General Information on March 27, 2015 by admin. In last week’s post, we left Maj. Gen. Phil Sheridan’s cavalry corps on the evening of March 31, 1865, having just suffered defeat at the hands of Confederate Maj. Gen. George Pickett. The Federal troopers were arrayed in a defensive perimeter a short distance north and west of Dinwiddie Courthouse, Virginia. Pickett withdrew several miles northward to a key crossroads known as Five Forks. His men dug in with orders from Gen. Lee himself to “hold Five Forks at all hazard.” But Lee could not send any reinforcements to Pickett because the rest of the Union army, including the Men of the Fourteenth Connecticut, were in close contact with the entrenched Confederates, and would know immediately if Lee weakened any part of his line. Grant had also placed Maj. Gen. G. K. Warren’s Fifth Corps, who were astride White Oak Road about six miles east of Five Forks, under Sheridan’s command. On April 1, Sheridan ordered Warren to advance his infantry westward along White Oak Road, while Sheridan’s cavalry advanced on Pickett’s position from the south. Heavy rains that had swept the Petersburg area the last few days of March ended, but the roads were still muddy. Movement was so slow that Warren’s men weren’t ready to attack until about 4 p.m. This great map from the Civil War Trust shows the results of the battle, a major defeat for Pickett’s force of infantry and cavalry. While Sheridan pressed nearly the entire length of the Confederate line with his cavalry, Warren drove hard against the eastern flank. The battle was over quickly, and Pickett, who was a couple of miles north enjoying a fine fish dinner beside Hatcher’s Run, lost nearly a third of his command, most of them prisoners. Lee’s western force was shattered. The way lay open for Sheridan to march up Ford’s Road and cut the South Side Railroad. Gen. Lee wired President Davis that Richmond and Petersburg must be abandoned immediately. This entry was posted in 1865, Appomattox Campaign on March 20, 2015 by admin. And thus the final campaign of the Civil war began for the men of the Fourteenth Connecticut. Not very exciting stuff, but what they were doing was an important piece of the puzzle that was Gen. Grant’s grand plan for ending the war quickly and victoriously. The role of Gen. Humphrey’s Second Corps was to move to the left (west) and keep pressure on the Confederates to their front, so that these troops couldn’t be sent to confront Sheridan and Warren. To the men of the Fourteenth Connecticut, this duty wasn’t special in any way, thus the brevity of the description at the start of this post. Heavy rains plagued the area until March 31st, but the strategic plan was implemented in spite of it. On March 29th, Gen. Warren’s troops fought and won a back-and-forth battle at Lewis’s Farm. On March 31st, several miles to the south, Gen. Sheridan wasn’t so fortunate when he tried to advance toward an important crossroads called Five Forks. A joint force of Confederate infantry and cavalry under Gen. George Pickett of Gettysburg fame, slowly drove Sheridan’s troopers east and south toward the Boydton Plank Road. Sheridan called up Gen. Custer’s Division and the Federal cavalry line held off assaults late in the day near Dinwiddie Courthouse. That night, Pickett withdrew his cavalry and infantry northwest to Five Forks. The action around Dinwiddie Courthouse is considered a Confederate victory, even though they suffered over twice as many casualties, 760 to 350 for the Federals. It was also the final time Lee’s forces would fight offensively. A WORD ABOUT COMMAND: If you’re interested in the command structure of the Union Army during the Appomattox Campaign, click here. It can be confusing, especially when we consider the Fourteenth Connecticut (Second (II) Corps, Second Division, Third Brigade). In February, Brig. Gen. Thomas Smyth was in command of the division. Early in March, Brig. Gen. William Hays, who was captured at Chancellorsville, returned from serving provost duty and was assigned command of the division. Smyth returned to command of the Third Brigade. On April 6th, Hays was found sleeping on duty and dismissed. Smyth once again assumed temporary command of the Second Division, but his divisional command lasted less than one day, because Brig. Gen. Francis Barlow was assigned permanent command. On April 7th Smyth was once again in command of the Third Brigade when he was mortally wounded at Farmville. Smyth died on April 9th, the day on which Lee surrendered. Smyth was the last Union general officer and the last man of the Third Brigade to die during the war. This entry was posted in 1865, Appomattox Campaign, Battles of the 14th, General Information on March 13, 2015 by admin.